At one point or another, we’ve all been asked to name five people, living or dead, with whom we’d like to have dinner. Why do we choose the people we do? And what if that dinner was to actually happen? These are the questions Rebecca Serle contends with in her utterly captivating novel, THE DINNER LIST, a story imbued with the same delightful magical realism as One Day, and the life-changing romance of Me Before You. 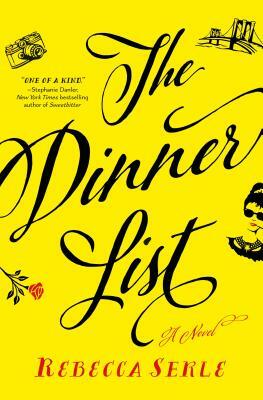 "I read The Dinner List in a single day, unable to tear myself away from this unconventional dinner party. Rebecca Serle draws you in with this clever and delightful story and then (when you least expect it) offers up some of the sharpest insights on first loves, friendships and family. This book is completely original and wildly entertaining." "This fun book will make readers reflect on friendship and lost love and how we remember the past." "A bittersweet tale of love, loss, and living with the memories." "Themes of love, loss, and forgiveness weave through this intriguing mix of the real and the fanciful." "The result is a fun meandering through time that also touches profoundly on the many different types of love we feel for others."